All of the press conferences at E3 undeniably caused a ton of chatter on social media. But among all of them, Microsoft’s was apparently the most talked about. At least according to a report by social analytics firm Brandwatch. 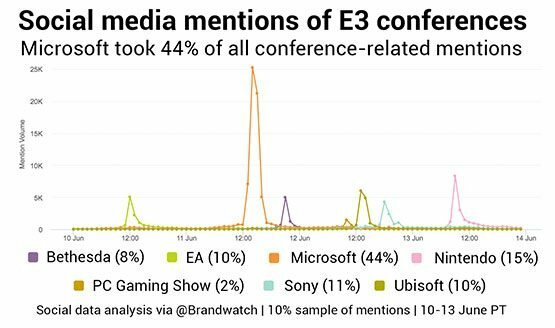 According to the report, which tracked 2.7 million English-language mentions of E3 2017 from June 10 to 13, Microsoft’s press conference held 44% of all social media mentions, although the data doesn’t specify whether the chatter was mostly positive or negative. The unveiling of the company’s new console, the Xbox One X, as well as the showcases of both Assassin’s Creed Origins and BioWare’s new IP Anthem definitely helped Microsoft gain a ton of traction on social media. Comparatively, Nintendo’s press conference held the second spot in the rankings with 15% while Sony had 11%. Additionally, Assassin’s Creed Origins was the most mentioned game during the time period, with Nintendo’s announcement of Metroid Prime 4 taking second and Marvel’s Spider-man holding third. Notably, the Metroid Prime 4 announcement consisted of only a 40-second showing of its logo.